On the Navigator locate the Parks [MITAB] Reader, and expand its list of settings. Double-click the reader Coordinate System setting to open the Edit Parameter dialog. Enter the coordinate system name UTM83-10 or select it from the Coordinate System Gallery by selecting "More Coordinate Systems..." from the bottom of the drop-down list. Remember, when a Reader’s Coordinate System parameter is defined as <not set> FME will automatically try to determine the correct coordinate system from the dataset itself. When the source dataset is in a format that stores coordinate system information (as it does in this example) you can safely leave the parameter unset. So this step isn’t really necessary. However, you MUST set this parameter when you wish to reproject source data that does not store coordinate system information; otherwise an error will occur in the translation. Now locate the coordinate system setting for the destination (writer) dataset. Again the value should be the default value of <not set>. Double-click the setting. Enter the coordinate system name BCALB-83 or select it from the Coordinate System Gallery by selecting "More Coordinate Systems..." from the bottom of the drop-down list. Save and then run the workspace. Open the FME Data Inspector. Choose Tools > FME Options and turn off the background map. If the background map is activated then the data is automatically reprojected to match, and this would not help us verify the results of the translation. Open the newly reprojected dataset. Query a feature. 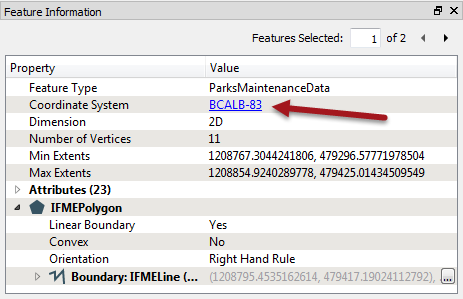 The Feature Information window should report that the data is now in BCALB-83. Optionally, click on the coordinate system name in the Data Inspector; a new window will open to display all of the coordinate system parameters. Reprojection can also take place using transformers – like the CSMapReprojector. In fact this might be considered the better method because the transformers include extra parameters for controlling the reprojection.